Inside a large home, or an unusual office layout, you’re going to almost inevitably encounter Wi-Fi dead-zones. Finding the right mesh router can plug those holes in your network, and make your connection more reliable in the process. Essentially anytime you’re trying to cover a bigger area, a mesh router is almost certainly going to become necessary for full network coverage. Fortunately, a mesh router isn’t all that different from an ordinary home-office router. Even if you only know the basics about your network, choosing one isn’t difficult unless you have some terribly specific requirements which need to be met. For example, nearly any mesh router in the $100 to $150 range will cover about 3,000 square feet. The Synology MR2200ac Mesh Wi-Fi Router is a combination of many common sense features. It also makes using many advanced networking features rather simple. Perhaps above all, the MR2200ac is capable of creating a comprehensive Wi-Fi coverage within bigger home and office environments. Running a network can be complicated. Some of its complexity is almost by design. Until recently, not many average Internet users would get terribly involved with the deep configuration of their network. 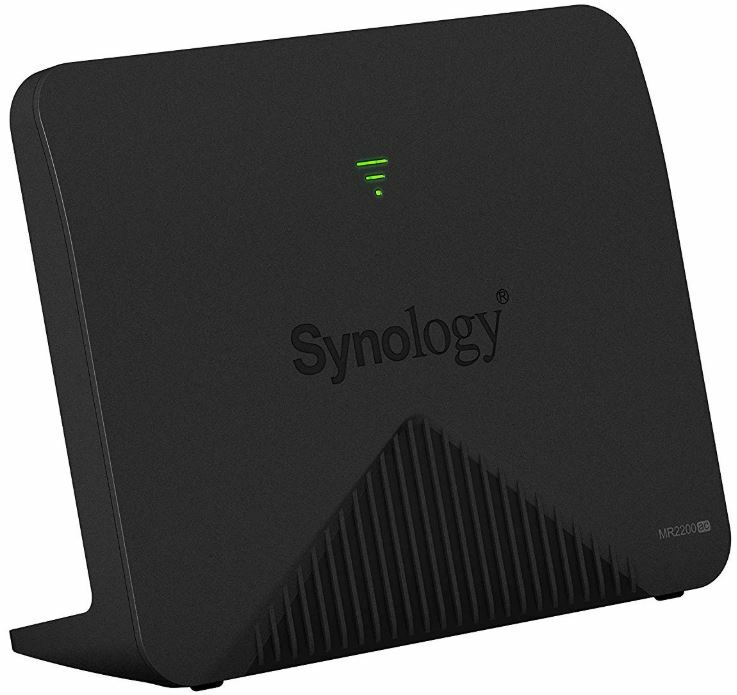 And the Synology MR2200ac Mesh Wi-Fi Router makes managing your network about as simple as using a word processor. But just because its features are simple to use does not mean it has a shallow feature set. This router actually provides almost every modern technology, setting, and core capability that you could possibly want from a mesh Wi-Fi router. 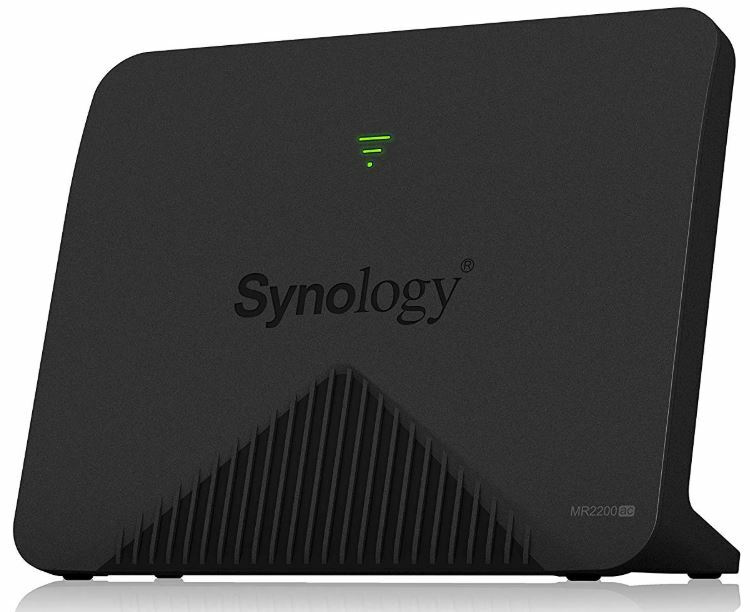 The Synology MR2200ac Mesh Wi-Fi Router measures roughly 2.6 x 7.8 x 6.0-inches. 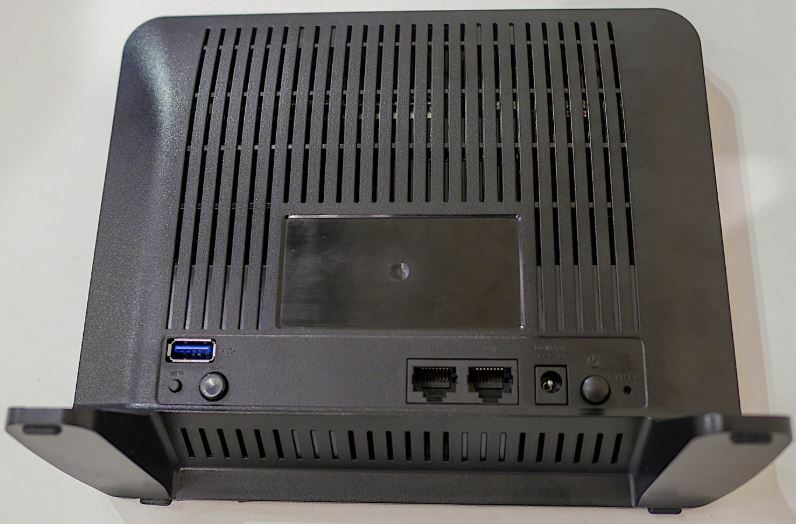 The simple black chassis doesn’t resemble many other routers. It sits vertically upright, and looks more like a digital alarm clock than a router. Instead of telling you the time, the front side of the chassis presents only three tiny indicator LEDs. They’re not labeled, but browsing the user manual can let you know how to interpret these LEDs when you encounter a network issue. On its backside, there’s a USB port. You can use the USB port to attach an external hard drive or flash memory, and then distribute files across the network. Next to that, there’s a reset button recessed within the chassis, requiring you to use some kind of pin or needle to access it. There’s also a pair of connections for DC power, and the power button. As with similar equipment, there’s a single WAN port and LAN port. And that means setting up this router is about as simple as connecting three wires. The MR2200ac is based on a QUALCOMM IPQ4019. Mixed with a tri-band construction, this router is intended to eliminate dead-zones within the furthest reaches of your home. The tri-band connection can support a total of 2.13Gbps of bandwidth. That’s the result of 400Mbps on the 2.4Ghz band, and 867Mbps on a pair of 5Ghz band antennas. With respect to its broadcast capabilities, the Synology MR2200ac can help extend your Wi-Fi signal out across roughly 3,500 square feet. No Wi-Fi signal will go through several feet of solid brick. The exact coverage depends on where you position the mesh router, and what kind of obstacles to the signal happen to be in the environment. Synology’s mesh technology will automatically choose the best connection for the various devices connected to the network. That selection is obviously made between the 2.4 GHz band, 5 GHz band, and Ethernet connectivity. The 2.4 GHz band is good for reaching places that do not have direct line of sight with the router. The quicker 5 GHz band provides the best possible wireless speeds, but only when devices have line of sight with the router. As you move from one part of your home to another, your smartphone might switch between different bands to take advantage of greater signal opportunities. But it’s not tri-band connectivity that makes this router’s connection so stable and significant, it’s the security features paired with sheer bandwidth potential. 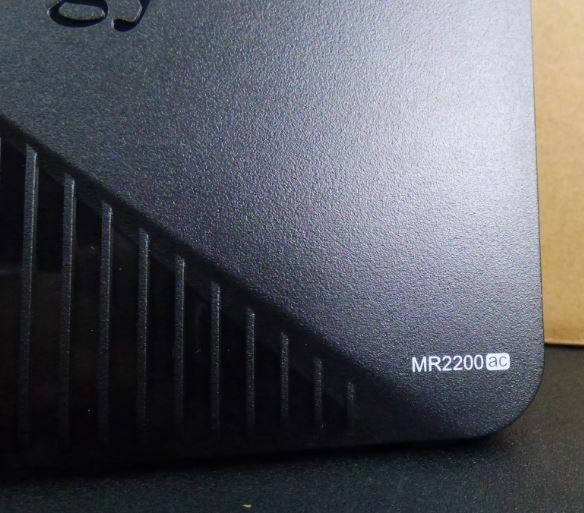 This router is based on the MR2200ac technology, allowing it to become a WPA3 router. If you’re not familiar with WPA3, it’s one of the newest announced security standards for Wi-Fi. Without getting into every gritty detail, it provides a number of new advancements in network protection to keep your network data from external threats. Internally, the Synology MR2200ac Mesh Wi-Fi Router makes use of a quad core processor. Each core runs at 717MHz, which is essential for handling some of the more high-end features packed into this router. For example, this fairly impressive little processor is critical for how the Synology MR2200ac Mesh Wi-Fi Router includes full support for MU-MIMO. Routers serve traffic on a first-come, first served basis. When there are only three or four devices on a network, there are rarely problems. But with a dozen different devices trying to get the attention of a router, the network can become inured with small computational tasks it needs to perform. MU-MIMO ensures every device on the network can get excellent performance, and performance stays consistent as several devices are added or removed. Managing a network can be tricky. Sometimes networking menus are made almost intentionally unintuitive because it’s assumed the person working them either has training, or otherwise knows what they’re doing. But that’s gradually changed as it’s been more and more common for average people to want to make adjustments to their network. And adjustments which exceed simply giving the network a name and password. The Synology Router Manager make this potentially intimidating process simpler by combining business-grade features with a terribly intuitive user interface. You can basically point-and-click your way through network setup, even when it comes to advanced settings. You need almost no experience or learning to start creating effective filters on the network. Setup can be done through a browser, or with the free Synology mobile app. 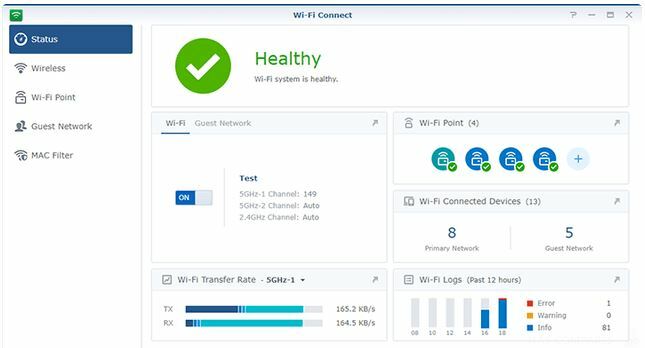 The first time you install the Synology MR2200ac Mesh Wi-Fi Router, the network will essentially configure and optimize itself for you. But using their mobile app, you can guide along the setup to make sure it gets your customization options right the first time. Those options also include more advanced guest settings and parental filters. Among them, you’ll find fairly detailed user profiles can be established, to help you create a kid-friendly environment. You can determine how long someone can use the Internet, protect from certain content, use SafeSearch filters, or even restrict someone on the network to using whitelisted websites. 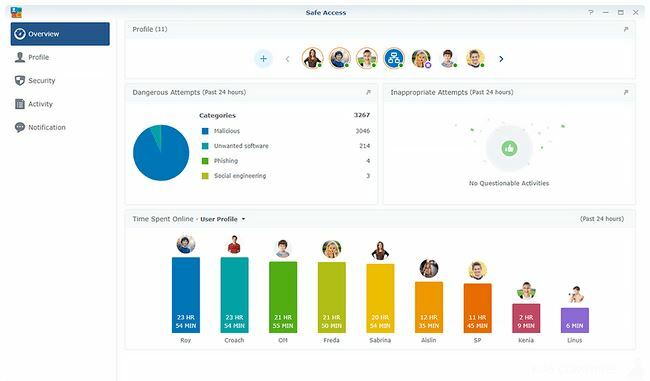 Apart from those filters of control, the Synology Mr2200ac Mesh Wi-Fi Router is capable of letting you see what devices are connected, and where people are going online. Such settings can be used to keep track of abnormal activities within the network. And ultimately, that allows you to protect all your gadgets with the aid of DNS and IP threat protection. You can block malware before it has a chance to do anything. Continuous updates keep Synology’s network protection software up to date automatically, so your network receives updates for threats before you know you’re vulnerable. That’s actually a fairly common feature among high-end routers these days, but it’s always worth mentioning because automatic cloud update features are a concern for those deeply interested in privacy. The Synology MR2200ac goes beyond offering essentials. It offers support for creating your own advanced VPN networks. Along with the help of WebVPN, Synology SSL VPN, the process of creating your own secure network is quite easy. This router also supports Apple Time Machine, SND Server, Media Server, and RADIUS Server. File sharing capabilities are facilitated with support for Cloud Station Server, which makes it possible to create cloud storage for your network. And you can share, sync, or backup important files across several devices using only the MR2200ac. Moreover, this allows the MR22200ac to facilitate a full range of media controls for smart TVs, gaming consoles, and so forth. Though the depth of control you have over gaming prioritization or streaming prioritization isn’t quite the same as routers made specifically for those tasks, you can still do essentially the same things. With respect to protection from malicious threats, the Synology MR2200ac Mesh Wi-Fi Router includes support for Layer 7 QoS. If you’re not familiar with that technology, it’s basically a library of information that can almost immediately identify and manage hundreds of common applications. It knows precisely what program you’re running, and what kind of permissions it should expect from the program. And that allows for deep packet inspection of everything that enters your network, giving you more control to shape traffic policies within the network. The Synology MR2200ac Mesh Wi-Fi router includes a two-year warranty. It also includes a 3-ft Ethernet cable you can use to help connect to another router, and all necessary power accessories. 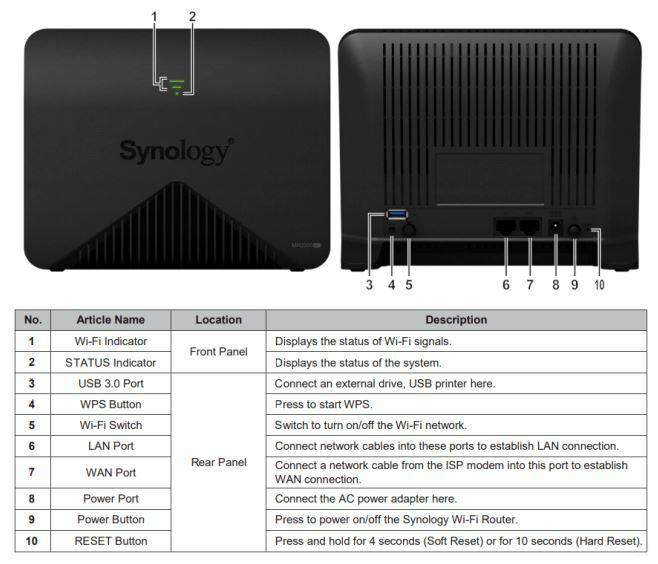 Who Should Choose the Synology MR2200ac Mesh Wi-Fi Router? The Synology MR2200ac Mesh Wi-Fi Router serves a very particular purpose. The biggest and strongest mesh routers are capable of blasting a strong Wi-Fi signal across nearly 10,000 square feet. If you were looking to fill a giant warehouse, you’d need a bigger Mesh Wi-Fi Router. But for most homes and small businesses, it will prove more than adequate. With respect to its features, the Synology MR2200ac Mesh Wi-Fi Router has essentially every major feature which routers have developed over the past decade. It uses the most recent Internet standards, and has networking capabilities to provide reliable service for years to come. It’s plausible, if not likely, that the Synology MR2200ac could be a fairly formidable router even in a decade. Because you can view everything from one Wi-Fi dashboard, it’s easy to manage and overview the network. And within that network, it provides every bit of control anyone could want. For most people in most circumstances, this router ought to be capable of creating an almost flawless network connection. 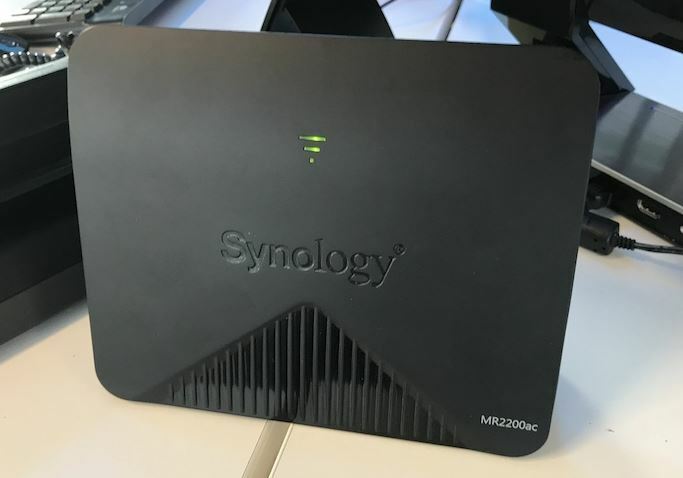 Provided you’re not trying to setup a network in a giant 10,000 square-foot warehouse, or create a network capable of sustaining more than 200 simultaneous wireless connections, then you’ll certainly find the Synology MR2200ac is both a capable and value-laden mesh router.